Dual Drive operates with emWave Desktop, emWave Pro or emWave2 only. Dual Drive's nine racing games and multiple challenge levels let you build up to the difficult races as you learn to self-regulate your emotions and play with more ease and flow. You have the option of racing against computer-generated opponents, or up to three friends who are connected to your local area network (LAN). 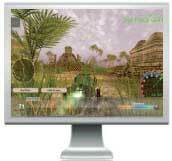 The highly interactive game gives you instant feedback. For example, if you lose your cool and focus on the racetrack, your visibility decreases and your gas tank starts to empty. Once you regain your poise, the fog clears, your gas tank begins to fill and you are back racing at 100%. 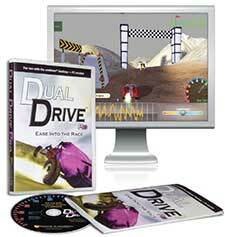 To get the most fun out of Dual Drive, you'll want to learn basic emotion self-regulation skills and have mastered the games on the emWave Desktop. The Dual Drive program runs on your computer in conjunction with the emWave Desktop for PC. * Dual Drive operates with emWave Desktop, emWave Pro or emWave2 only. Each is sold separately. Multiplayer option lets you race against up to three live opponents who are part of your local area network (LAN). Option to select up to three computer-generated opponents and their speeds. Racers may select autopilot mode when first leaning how to maintain coherence and ease. Background music, with optional vocals or instrumentals, increases and decreases with coherence levels, or may be switched off. On-board display shows real-time heart rates, heart rhythms and coherence levels in lower portion of game screen. Includes detailed user guide to maximize your experience. Note: Dual Drive® Pro was developed by Somatic Vision Inc., under license from Quantum Intech Inc.